The Lady of the Lake, or ‘La Dame du Lac’ is a statue you will have definitely seen if you’ve driven the road leading to Val d’Isère or Tignes. Often shrouded in fog, her dark silhouette oozes mystery and darkness as you pass by her on your way to your ski holiday. We have driven past many times, and yet still feel the need to stop and take photos. Something about the location, the water, the valley mouth creates a dramatic weather system which calls out to people passing. The Lac du Chevril’s Dam is one of the largest in Europe, towering a substantial 160m high and with an unmistakeable painting. Have you driven past multiple times, wondering what the painting is of? Well us too! It turns out that it’s a painting of Hercules, created in 1989 by Jean-Marie Pierret and a band of 8 mountain climbers. Rather them than us. Thought to be one of the largest in the world, the painting is for many people a marker point when you know you’re close to the slopes. But the Lady of the Lake holds more precious secrets of a life past. The original village of ‘Tignes’ was in fact, not where it is today. Sitting just below Tignes Les Boisses, the original village sat at the bottom of what is now the lake. After the 2nd World War, France found themselves in need for electricity. Trying to be forward thinking, they planned to build the dam as a hydro-electric dam, on top of the previously standing village. As you can imagine, this was met with a lot of resistance, from peaceful protests to people attempting to blow up the dam. The village housed 60 inhabitants, a church, a school and a post office. The move was not a simple one, and many buildings were destroyed in the process. But it wasn’t just the relocation of the village which caused controversy surrounding the new dam. 52 people died building the dam and many more lost lives whilst digging out the underground tunnels which link the power stations. When the dam was finally finished, in 1952, the remnants of the old village were flooded and the lake created. The dam was expected to provide power to 10% of France. Unfortunately, the designers were less forward-thinking than they thought, as shortly after this the rise of nuclear power meant that the dam had very little purpose and has in fact never been used for its original intentions. 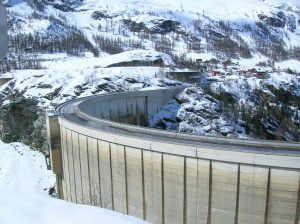 It is now used as a backup power supply to the resort of Tignes. Memories remain, and some of the inhabitants, and many of their relatives still live in the surrounding areas, there is a replica of the original church located in Tignes Les Boisses. Every 10 years the lake is drained for maintenance to the dam, and sometimes, in the summer the lake gets low enough for you to see the remains of the village that once stood there. When the lake is drained you can walk through the village and even into some of the old houses. Having just discovered this, it was last drained in 2014 so we’re rather disappointed that we have to wait another 6 years before we can go and wander the eery remains and learn more about the old village. It’s astounding to think how many hundreds of thousands of people must pass by the lake every winter with no idea about the history or what lies beneath. In 2003 the lady of the lake appeared to commemorate the 50th anniversary. Legend says that during the relocation of the village one lady refused to leave her home. This lead to her drowning when the village was flooded, and that the statue is a representation of her watching over the village under the lake. Personally, if I had done that for my village I’d be pretty upset that it took them 50 years to commemorate me! All we know, is that if you’re driving past it’s well worth stopping at one of the various viewpoints and taking in the sheer size of the lake and dam.